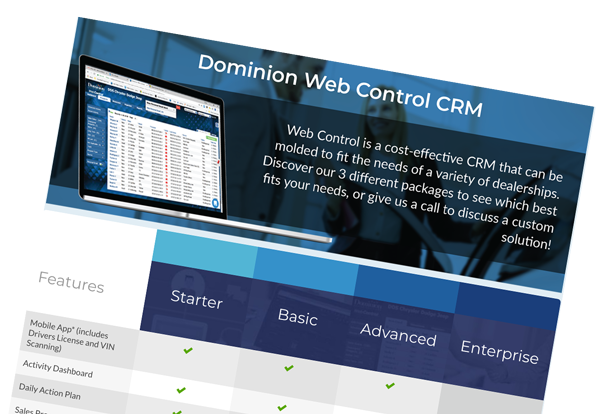 Dominion Web Control™ is a web-based automotive dealer CRM and lead management solution built to manage and market to both leads and prospects. Web Control pulls lead data from over 300 sources including your website, your OEM’s website, and third-party websites. Dominion Web Control serves both franchised and independent car dealerships and is certified by most manufacturers including General Motors, Hyundai, Subaru, Toyota, Honda and many more! Today, your team needs more than just a lead manager. With Web Control automotive CRM, you can improve your sales team’s efficiency and closing rates. Post-sale follow-up processes are easily established. When utilizing text messaging from within the prospect’s record, it’s easy to chat and keep a transcript of the communications in the dealership CRM. Of course, we keep you legally compliant with texting laws and regulations. Compliance is easy with our opt-in process. Utilize ready-made templates with merge fields. Texting history stays within the prospect record for reference. Text from within WebControl – no need to use a phone and the product. The integration between these two solutions is seamless. Connect via phone within a minute of a lead submission. Leads are simultaneously updated in both, enabling you to work the lead from call to sale with accurate real-time information. Drive more appointments and more conversions. Appointment notes are captured in both systems. Calls are recorded, scored and saved in Web Control. 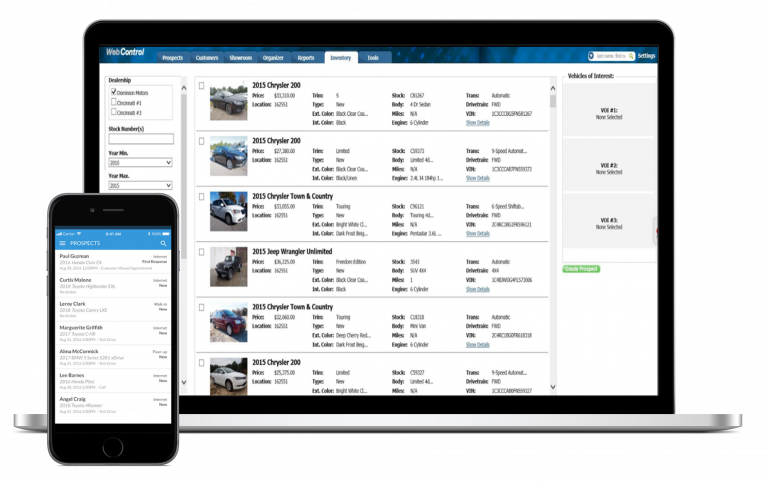 Web Control’s enhanced inventory features allow you to track all of the vehicles that pique a customer’s interest, send interactive vehicle brochures to potential buyers and flag the vehicles customers want, even if they aren’t in stock. Save a vehicle that is not currently in stock to a customer record. When the vehicle is in-stock or a customer has a trade that matches, you’ll be notified of the match. Attach up to 3 vehicles the customer is interested in onto their prospect record. Send shoppers emails with links to interactive landing pages containing vehicle images and details. Discover the 7 reasons you’ll love using Web Control to track phone, floor, and Internet prospects and customers. 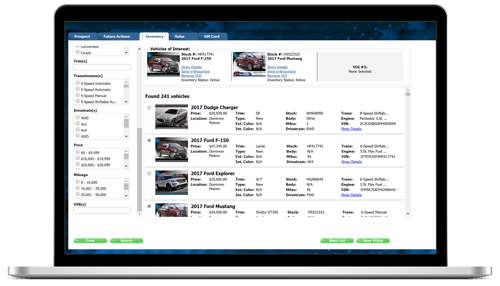 Discover Web Control’s 3 cost-effective packages starting at $99 per month to see which best fits your dealership. Watch Terri Biggs, Customer Care Manager, explain why her dealership enjoys using the Web Control CRM and how its integration with Calldrip has sped up their lead response times.